Boror Tenga is a traditional red lentil curry from Assam. In Assamese, Bor means pakoda or fritters and Tenga means sour. In Boror Tenga, soft red lentil fritters are cooked in a sour curry made of tomatoes, onions, potatoes, and bottle gourd! Boror Tenga is like the Rajasthani Mangodi ki sabzi but very unique in its preparation. I was quite intrigued by the mix of vegetables in this lentil curry. Usually, the base of most curries is only onions and tomatoes but here we have potatoes and bottle gourd too. 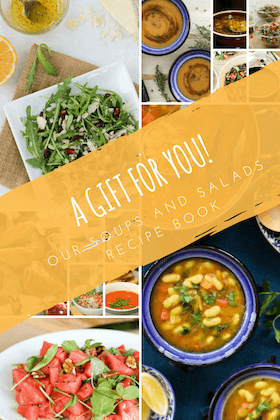 This recipe is like a celebration of fresh seasonal produce and it’s not like the vegetables are simply put together without any thought. The potatoes are boiled and then mashed before adding to the curry. Boror Tenga has a thick consistency with the gravy sticking to the lentil fritters. It is the grated potatoes that give the gravy its consistency. Bottle gourd (called lauki or dudhi in Hindi) was definitely a surprise ingredient for me. I do use grated bottle gourd to make fritters for lauki kofta curry but had never added them to a lentil curry just like that. But they nicely added to the texture of the gravy. Loved the seeds and bottle gourd pieces in every bite. Since we don’t get bottle gourd in Bucharest, I have used Zucchini which adds a similar texture and flavour. Apart from the mix of vegetables, the taste of the gravy is further enhanced by cooking in mustard oil with a tempering of Bengali panch phoran spice mix. The traditional Bengali panch phoran spice mix is a mix of 5 spices – cumin seeds, nigella seeds, mustard seeds, fennel seeds, and fenugreek. Panch Phoran mix might be associated with Bengali cuisine, it is actually used widely in that entire region in Bengali, Bihari, and Assamese cuisine. I’ve used it before in cooking Panch Phoran Baingan and Aloo posto recipes. The inspiration for this recipe comes from fellow blogger Sujata’s post. Assamese cuisine is very vibrant and while it is known more of its fish, there are some delicious vegetarian Assamese recipes like this Boror Tenga, baingan pitika, and aloo potol. After the success of this delicious lentil fritters curry, I’m sure I will soon explore other dishes too. 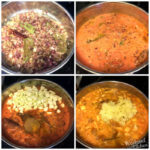 Since the recipe is a bit involved when you are making it for eh first time, I have also clicked step-by-step process photos to help. Despite the list of ingredients, it actually is quite simple once you have everything handy. Boror Tenga is a traditional red lentil curry from Assam. In Assamese Bor means pakoda or fritters and Tenga means sour. In Boror Tenga, soft red lentil fritters are cooked in a spicy and sour curry made of tomatoes, onions, potatoes, and bottle gourd. It is medley of beautiful flavours and textures. Drain the soaked red lentils. In a small kadhi/wok, heat the vegetable oil for frying. 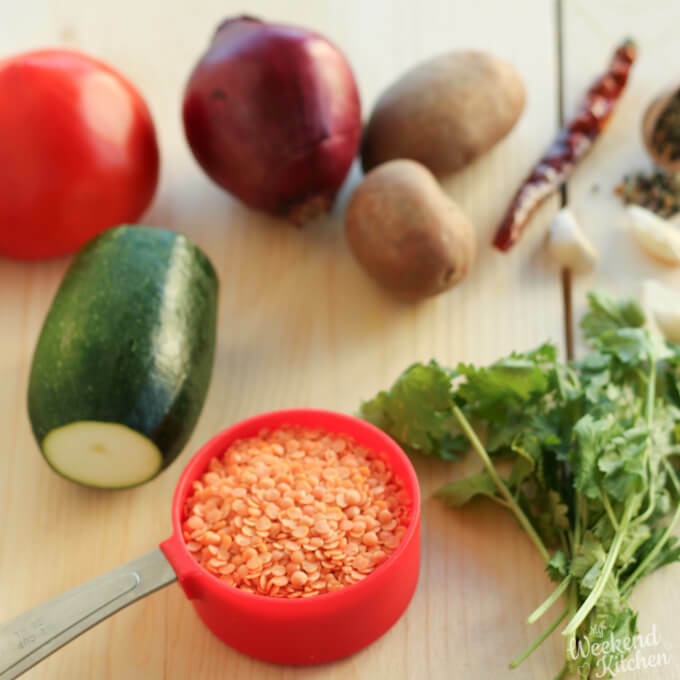 In a blender jar, combine the soaked red lentils with green chilli, ginger, and asafoetida. Add a little water and blend to a smooth paste. Remove in a bowl and whisk it with your hands till the batter is light and fluffy. This will ensure that the lentil fritters are very soft. Add salt and mix one more time. When the oil is hot, carefully drop spoonfuls of batter into the hot oil. Do it in batches so that the oil is not crowded. Fry till the fritters are golden brown. Remove from oil onto an absorbent kitchen paper. The good thing about lentil fritters as that they don’t absorb a lot of oil. Heat mustard oil in a pan till it just begins to smoke. Reduce flame to low and add the panch phoran spice, bay leaves, and dried red chilli. One the seeds start to sputter, add onions and garlic. Mix well and cook for a couple of minutes till the onions start to soften. Add tomato puree. Mix well and cook covered for 2-3 minutes. Now add all the powdered spices, bottle gourd, and 2 cups of water. Mix it all well and cook covered for 5-6 minutes till the bottle gourd is cooked. Mix in the grated boiled potato. Adjust seasoning and let the gravy simmer for 2 minutes. Just before serving, add the fried lentil fritters to the curry and reheat if required. Garnish with fresh coriander leaves and serve hot. The sourness of the curry comes from tomatoes. You can add some lime juice to increase the sourness. If you don’t have the panch phoran spice mix, use 2 tsp equivalent of a mix whatever individual spices you have from — cumin seeds, mustard seeds, nigella seeds, fennel seeds, and fenugreek seeds. Lentil fritters will soak up any remaining water in the curry. Add them right before serving else they will become very soggy and break. It is interesting how this recipe came to me. 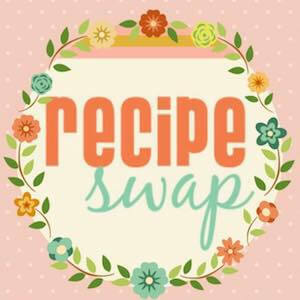 In order to explore new recipes and learn from other food bloggers, I joined a Recipe Swap Group of Indian food bloggers. This is my first time doing any such thing and I was paired up with Sujata of the blog Batter up with Sujata. 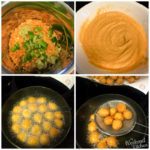 When I browsed through her blog, I saw this Assamese Tenga recipe. It was something that I had never tried before in any variation so I chose this one and I’m glad I did. In this day and age of digital communication, I have one pen-friend (remember to whom you write letters and have never met? Just like that). When I told her about me making Boror Tenga, she was so excited! “It is one of my favorite vegetarian dishes!”, she said! I was so glad I made it. A delicious preparation full of healthy ingredients Ashima. I had seen this on Sujata’s blog and bookmarked this recipe, but haven’t got down to trying it. I like that these vadis or badis we don’t have to sun dry. This is absolutely a wonderful recipe and I would like to make it sometime soon. Love the similarities between different cuisines yet using their own special seasonings. Lovely clicks! This curry is really very delicious.. I had also made it some time back. Did you make it just like this or added a twist? would love to know! Lovely recipe..love to try this with garma garam roti. Assamese red lentil fritters curry is just inviting me, and those fritters looks adorable and tempting to the core. Excellent curry to relish with a bowl of rice definitely.Lovely pick. It was quite delicious 🙂 We actually ate the leftovers with some couscous and it went perfectly well with them too! Wow this is so similar to mangodi sabji or we even have one as karara sabji(ursd Dal fritters). Loved your step by step prepation and and the addition of zucchini is definitely very healthy and yum. Those vadis look so tempting, I am afraid I will finish them before they go to the curry…lol. The curry sounds so delicious Ashima ! Would love to try it out soon. Thanks for the share. It was a surprise find for me too 🙂 Truly a gem from Assamese cuisine! Interesting and delicious recipe. Love to taste with Rice. Thanks, Sasmita! Yes, isn’t Indian cuisine just great in that! This looks superbly delicious Ashima. Hope you liked it. You have used bottle gourd in it. Which makes the dish healthy and little different. Lovely share. Thanks, Sujatha! and super thanks for the recipe. We loved it and our friends loved it:-) which is why the dish came to the blog too! Such a delicious and yummy curry. I love the use of seasonal veggies too in it. Bookmarking! what a great pick of the recipe for the event. 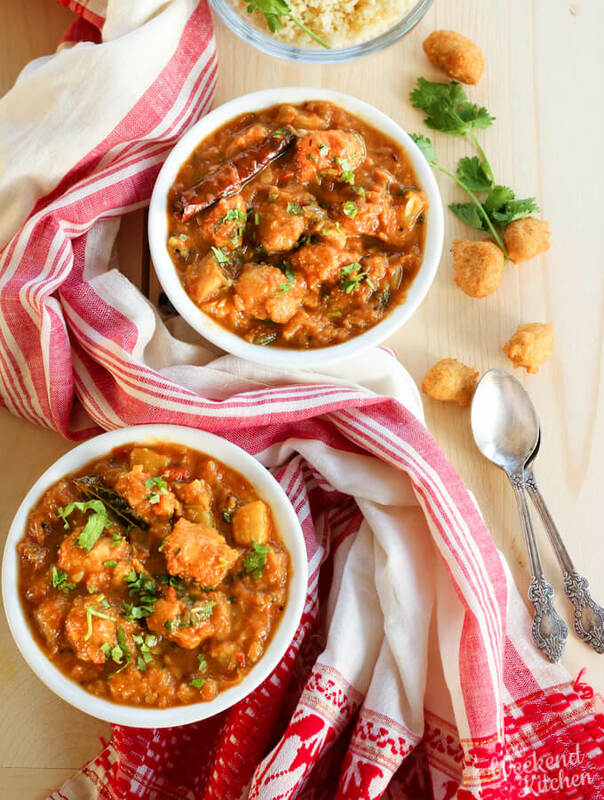 having red lentil fritters in gravy sounds healthy and delicious. I am surely going to try this. 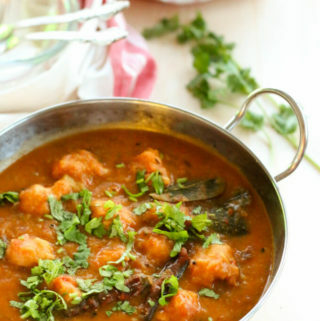 Love this version of mangodi and make curry.